46 – World War Hulk by Greg Pak & John Romita Jr.
Hello Handsomites! Eric and Robbie are fresh, rested, and recording together for this amazing episode! They take a look at the week’s newest books, including Ghost Rider and Silver Surfer #1, not to mention the oft-delayed Sandman Overture #2! In Nerd Boy Book Club they discuss World War Hulk as a counterpoint to the Sinestro Corps War, and ask if the former succeeds where the latter failed. Finally, Robbie defends the second and third Matrix films in Guilty Pleasure! More podcast, more fun, more of the best! 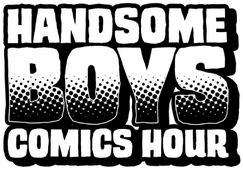 This entry was posted in Episodes and tagged catwoman, deadly class, drama, freakanomics radio, ghost rider, greg pak, john romita jr, raina telgemeier, sandman overture, silver surfer, smile, superior spider-man, the dead authors podcast, world war hulk on March 31, 2014 by handsomeboyscomicshour. One writer, one artist, one weekly discussion about comics and nerd culture. Your home for news, reviews, slightly antagonistic banter, and much much more! Hey, there, Handsomites! We are your hosts Robbie Dorman and Eric Z Goodnight. Your home for news, reviews, slightly antagonistic banter, and much, much more!